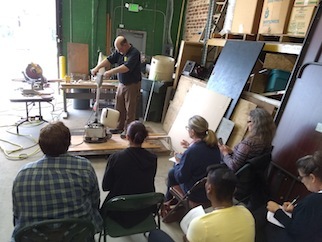 We host free DIY workshops at TLD! Here are some examples of topics we've covered in the past. Want to check out our current schedule or suggest a topic? Visit our Workshop page! 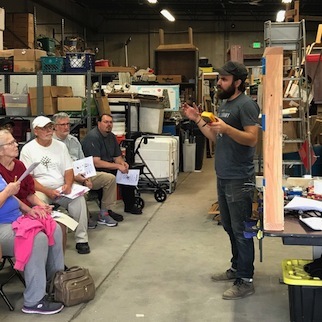 Returning instructor Lawrence Oliva from Second Century Homes gave attendees all the tips and tricks for working with reclaimed hardwood flooring. Participants got to try their hand at prepping the flooring and then installing it with a pneumatic nail gun. 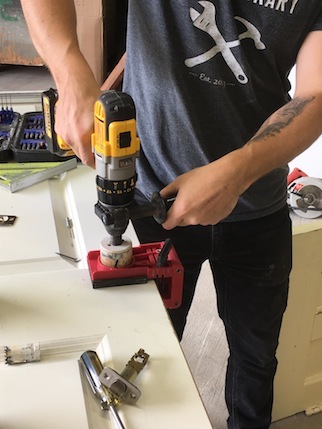 Instructor Zach returned to TLD to teach the basics and tools needed for rewiring, and how to trouble-shoot finicky table and pendant lamps. Plus, we got to use our new workshop station! Courtney, one of our partners at Canton Ace Hardware, returned to demonstrate how to patch, troubleshoot, and repair holes in drywall. 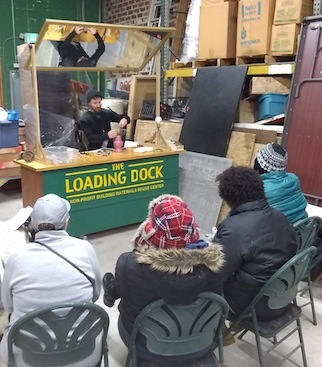 Participants learned how to prep, spackle & smooth drywall surfaces to conceal dents, nicks, nail holes, and even larger sized holes using a variety of materials readily available at The Loading Dock, Inc. or local hardware store. Nancy from SCRAP B-More showed us how to make rugs out of cove base (the vinyl material that runs along the wall by the floor). These mats are creative way to repurpose a material into something really useful! 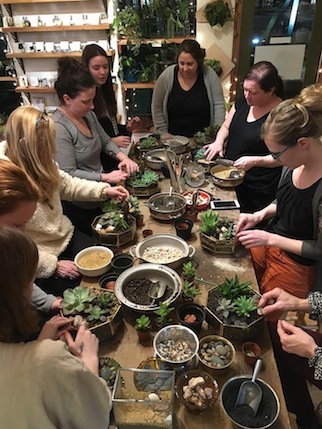 The Loading Dock, Inc. paired up for this workshop with B.Willow, an indoor plant and terrarium shop located in the Baltimore neighborhood of Remington. 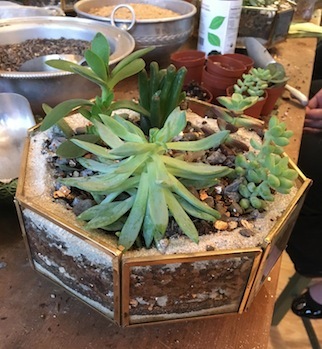 Participants turned repurposed glass light covers into beautiful succulent planters to take home. Lawrence Oliva returned to demonstrate how to install tile backsplashes through hands-on activities including spreading grout and placing tile. 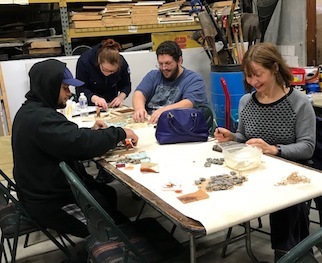 Instructor Pat Stein was joined by the Parks & People Foundation, and returned to show participants how to mix thin-set mortar and grout, and turn reclaimed ceramic tile and bricks into beautiful stepping stones! We had a great time teaming up again with B.Willow, a indoor plant and terrarium store in Remington. Participants used wallmount light fixtures from TLD and turned them into beautiful planters for vining tropical plants from B.Willow. 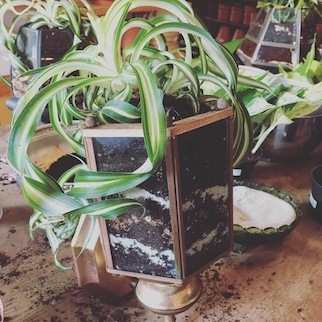 You can make your own too with a fixture from TL, and plants & potting at B.Willow! 1) Take out electrical components. You'll need wire cutters, screwdrivers, and needle-nose pliers. 2) See if there's room for water to drain out of the bottom of the fixture. If it's a big hole, you will need to put a stone over it when potting to make sure the soil doesn't fall out. 3) Layer gravel then soil, leaving about 2" from the top of the planter. You can also layer with mica or stones to create a beautiful design that you can see through the glass. 4) Add your plant and mount the planter fixture to a wall or deck! Long-time workshop instructor Mark Weaver returned to teach the foundations of kitchen design, and the concepts of using reclaimed materials like cabinets. 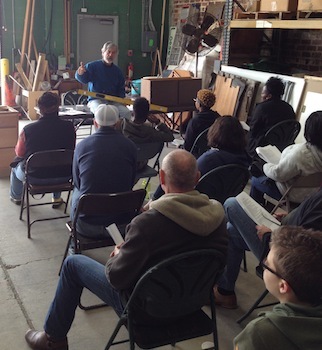 Knock, knock....Arman Mizani from the Station North Tool Library returned to teach attendees all about doors! Participants learned about changing locksets and shaving down doors that no longer fit in their frames. Instruction also included the order of operations for hanging a new door, including mortising hinges and drilling holes for new lock sets. 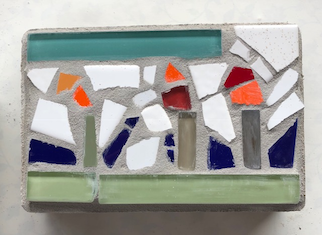 Longtime TLD Instructor Pat Stein taught participants how to use broken & miscellaneous tile to create beautiful hot plates to take home! 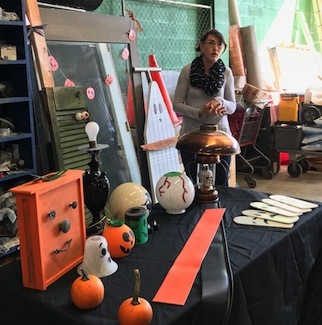 TLD Staff member Colline showed attendees different types of spoopy decorations that could be made from materials found in the warehouse! Each participant learned how to make chalkboard paint and created a chalkboard gravestone out of an old cabinet shelf! Arman Mizani from the Station North Tool Library taught participants how to navigate electrical issues in old houses & how to complete projects like changing out light swtiches and ceiling fans. Attendees got to try out wiring and safety skills on a mock up circuit. 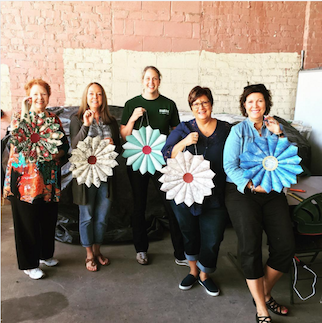 Returning TLD instructor Abbey Wascovich led the workshop attendees through the process of making their own decorative wreaths! 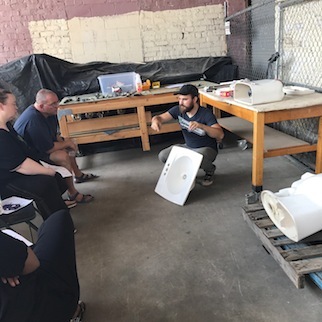 Arman Mizani from the Station North Tool Library returned to demonstrate how to troubleshoot and install toilets and bathroom vanity tops! Arman Mizani from the Station North Tool Library demonstrated how to safely use several different types of power tools. Participants got a chance to try each of the tools and were able to practice creating a miter joint. The Station North Tool Library is a community hub and lending library located in the hert of Baltimore with over 2,000 tools, 25+ classes, and a public woodworking shop. Open Works, a maker space in Baltimore, has the mission to make tools, technology, and the knowledge to use them accessible. Their mobile unit visited us and brought a CNC (Computer Numeric Control) machine that etched wood with a laser! 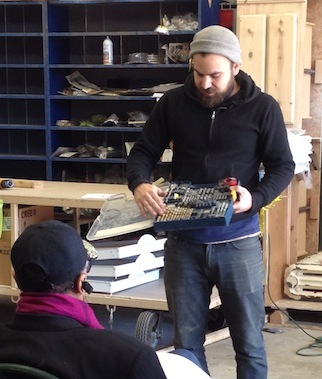 Workshop attendees made message boards out of repurposed cabinet doors! Our insturctor, Abbey, is a workshop attendee-turned-instructor, who brought in examples of ones she made from TLD materials! 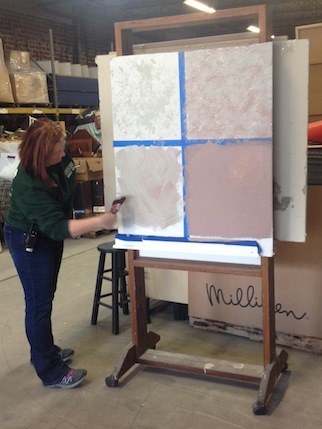 TLD Staff member Amy demonstrated how to fix small imperfections in drywall to prepare for painting. 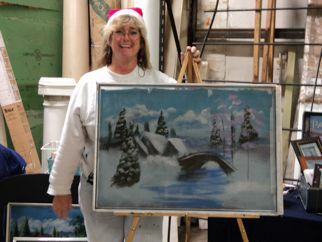 She also demonstrated several different painting techniques! 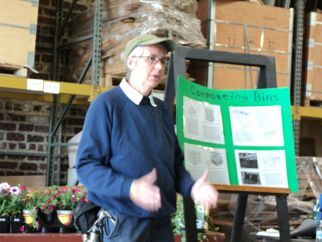 Local homeowner Mike Bowman led a demonstration on working with bricks often found in Baltimore rowhomes. Participants got a chance to try out the repointing process and learn the nuances and tricks for working with older bricks. 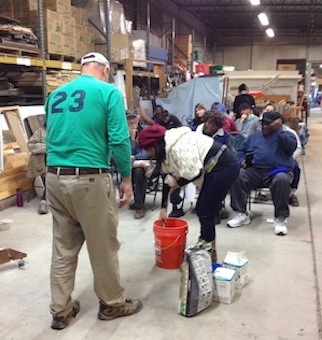 Instructor Mark Weaver led a hands-on demonstration in installing floor tile. 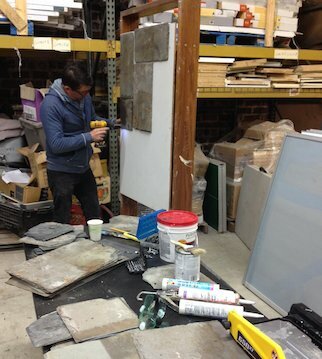 Local artist and TLD advocate Michael Metcalf showed how reclaimed roof slate can be used on walls too! 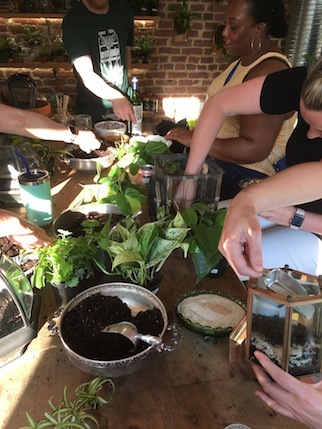 Long-time TLD supporter/workshop instructor and now TLD staff, Pam Stiles, taught the attendees how to build their own compost bin and the basics of container gardening. They also planted a vertical garden. See the examples here. 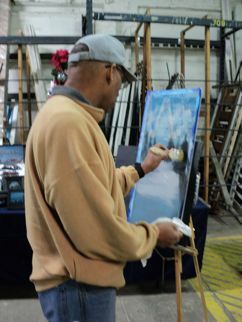 TLD hosted an "Alternative Use" workshop on painting screens, a Baltimore tradition, taught by expert Screen Painter, Anna Pasqualucci.